On February 28, 2015, the Board of Trustees for Sweet Briar College unanimously voted to close its doors after 114 years. Sweet Briar College is a private liberal arts institution for women, founded in 1901, which has an enrollment of 703 students (graduate and undergraduate). Sweet Briar College is located about 100 miles west of Richmond, Virginia on 3,250 acres near the Blue Ridge Mountains, which can only be described as a pastoral setting. 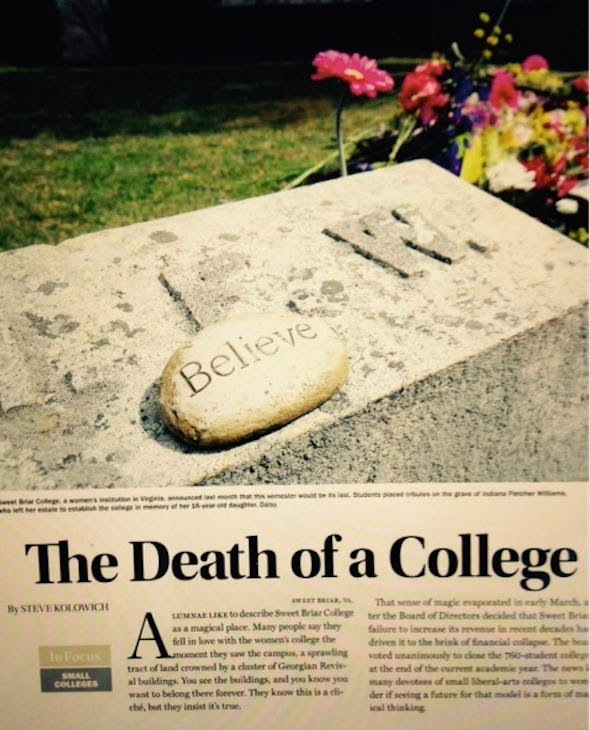 In 1965, according to the Women’s College Coalition, there were 230 women’s colleges in the United States. Now, fifty years later, after shutdowns, coed conversions and mergers, there are just over 40 left, including well-known Smith, Barnard, Bryn Mawr, Mount Holyoke, and Wellesley. 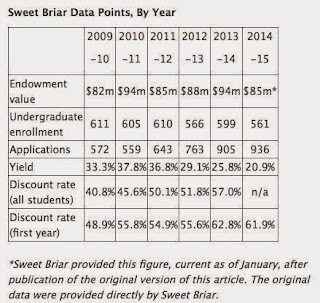 The major problem for Sweet Briar is that most students get a discount from the $34,000 tuition. Over time, that discount has been growing to the point that with declining enrollment, the university was no longer financially viable in the long term. You can see that from 2013-14 to 2014-15, the endowment value dropped by $9,000,000. 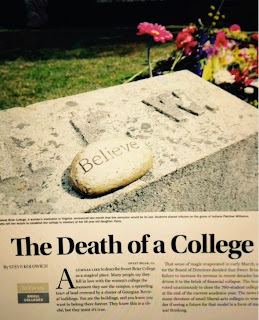 The Board of Trustees made the decision to close the doors now rather than twist in the wind and die a slow death. Sweet Briar College will close on August 25, 2015 and the graduating class of 2015 will be its last. Compare what happened at Sweet Briar with what’s happening at St. Cloud State University. In 2010, enrollment at SCSU was 15,095 FYE. In 2015, enrollment is 11,800 FYE for an enrollment drop of 21.8%. A 21.8% enrollment drop makes a drop of 7.9% drop look almost tiny! In FY14, SCSU had a budget deficit $11,555,000 and the FY15 budget presented on October 16, 2014 showed a deficit of $9,542,000. By the end of this fiscal year, the mandatory reserves of $10,500,000 will be gone. However, MnSCU is like having a rich uncle with a $300,000,000 bank account. It’s unlikely that SCSU will close its doors—at least not before a lot of other options are tried. SCSU is undergoing a process that is attempting to cut over $9,000,000 in expenditures from the FY16 budget to more closely balance revenues to expenses. An expenditure reduction of this size will amount to the loss of approximately 75 FTE faculty positions and 50 staff positions. Unfortunately, this will not be the end of the cuts. In FY17, additional cuts will have to be made to start to rebuild the mandatory reserves and pay back MnSCU for the cash provided to cover SCSU’s losses. SCSU has submitted a financial recovery plan to MnSCU, but in the plan, it appears that the only money that would be available to repay the reserves and the money borrowed from MnSCU is from the excess tuition to expenses. A portion of the latest document for budget planning is reproduced below. With just over $9,000,000 cut from the FY15 budget, the projection for FY16 is for a loss of $679,000, which is due mainly to a capital appropriation of $1,038,000 that cannot be used to pay operating expenses. For FY17, the projection is for a slight increase in revenue and a slight increase in expenses but without any capital appropriations leads to a surplus of $352,000. This $352,000 would be available to help restore the reserves. Unfortunately, $352,000 would only replenish 3.4% of the required reserves and leave the loan from MnSCU unpaid. Unfortunately, for FY18, despite a projected increase in revenue of nearly $3,700,000, the projected expenses increase by $5,400,000, leaving a deficit of $1,159,000. Similarly, projected revenue increases in FY19 but the projected expenses increase by almost the same amount leaving a projected deficit of $1,121,000. Clearly, projections this far into the future are about as reliable as reading tea leaves or predicting the winning Powerball numbers. Vice President for Finance and Administration Tammy L. H. McGee, in her comments at the last MnSCU Board of Trustee’s Meeting made it clear that she understood that she was using the system’s money to fund the university through this recovery. However, from this plan, it certainly looks like there is no way to rebuild the reserves to the required $10,500,000 and repay MnSCU in the next few years. In looking at the projections, there is a lot of ‘red ink’ all the way through the projections for FY19. All things being equal, this budget projection does not solve SCSU’s financial problem. In fact, according to this budget projection, SCSU’s deficit actually grows! At the same time, a parallel question comes to mind. What makes anyone think the leadership that watched as enrollment declined 21.8% over the past five years and budget deficits for the past two years that averaged over $10,000,000 per year can restore sustainable fiscal practices at SCSU?